This 10x magnifying glass from Brooks-Range is a great tool for analyzing snow crystals. It has US and metric scales and folds flat for compact storage and easy carry. The magnifier uses a one-inch glass lens for distortion free viewing with inch and millimeter markings on the perimeter of a 1-inch square viewing area. The magnifying loop opens to 1.875" x 1.5" x 2.25" (4.76 x 3.8 x 5.7 cm), or folds down to just over a half-inch high. 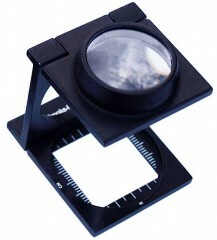 The Brooks-Range Folding Magnifier Great addition to any snow study kit or an upgrade to your current lens. Five Stars for these fabric loupes: very light, folds up very small, yet then sets up in a stable way on top of your snow crystal card. You can get higher-power magnifiers, but they're heavy, bulky, and pricey. Bonus application for this magnifier: works really well for checking out the fibers on your climbing skins!